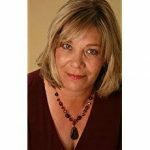 Barbara Samuel (O’Neal) has won the highly prestigious RITA award from Romance Writers of Americas seven times and has been recently inducted into the RWA Hall of Fame. She has written eleven novels of women’s fiction, about dogs and food, families and second chances. She lives in the stunningly beautiful city of Colorado Springs with her beloved, a British endurance athlete who vows he’ll never lose his accent. She attempts to garden despite hail and blizzards and the thin mountain air, and loves to travel, teaching and hiking and eating lots of great food. About halfway through the novel, I thought to myself, “This is a romance novel and I do not like romance novels.” Notice I was halfway through the book when I made this discovery. I can also share that I stayed up all night and finished this book around four o’clock in the morning. Apparently I might need to rethink my bias. 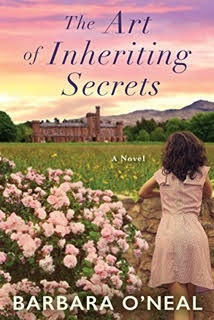 The Art of Inheriting Secrets may include some romance but it also contains LOTS of food (which is why I originally picked up the novel). For a complete list of the culinary offerings that O’Neal describes, see the final portion of this post. I enjoyed O’Neal’s knack for characterizations, especially in Olivia’s case. Our heroine finds herself amid some distressing situations in losing her mother and (partial spoiler alert) breaking off a long time romance, yet she does not appear tragic. She finds out she is a countess and has inherited a large estate but this is not fairy tale. The whole Malakar family was just enchanting and I would love to be a family friend included in their communal meals or a diner at Coriander. I also appreciated that O’Neal did not resort to the typical romance formula of the couple connecting with a promising and budding love affair only to break up because of a trivial misunderstanding (and only to be reunited in a passionate denoument ). At one point I was afraid Olivia and Samir would wander down that meandering path; they thankfully did not. There was a bit of predictability in the novel. Like I said, it’s a romance so you knew the whole couple-thing would work out. The mystery of the young girl’s disappearance was expected and foreshadowed. And, maybe it was just wishful thinking, but I hoped and expected that Grant would meet some sort of comeuppance. I did enjoy the book and just mentioned it to a friend who said she was in the market for something else to read. Samir, Pavi’s brother and Olivia’s love interest, makes his secret ingredient chai for Olivia a couple of times in the novel. I decided to combine these two delicious beverages. 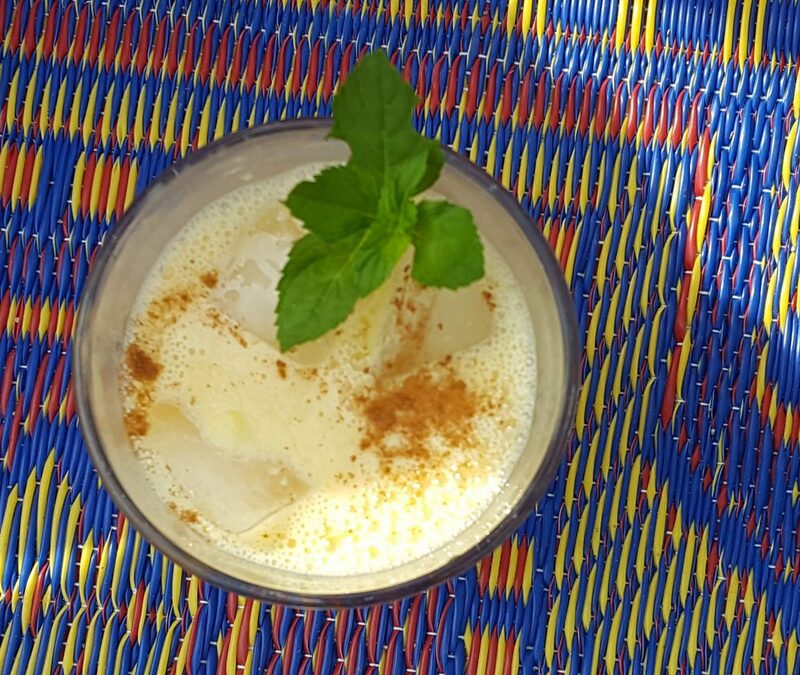 A refreshing yet mildly spiced treat on a hot and humid summer day. Place tea bag in boiling water and let steep for 3-4 minutes. Remove bag and let tea cool. When tea is cool, place the tea in a blender with the mango and yogurt. Blend until smooth. Serve over ice. Garnish with a dash of cinnamon and a fresh mint leaf. A couple of good English rhubarb crumbles appear throughout the book. I am linking up with August’s Foodies Reads. The problem with a lot of romance (or other genre) fiction is it tends to be one-dimensional. But some of the best stories ever are “romances.” Everything Jane Austen wrote. A lot of what Shakespeare wrote. Trollope. The list goes on. But none of what those guys wrote used a simple formula, which is why people get tired of romances (or mysteries) unless they really are partial to the genre. Anyway, sounds like a good book. And it certainly sparked a terrific recipe! This looks good — thanks. Very well said. I think that’s my problem with the mystery genre as well. 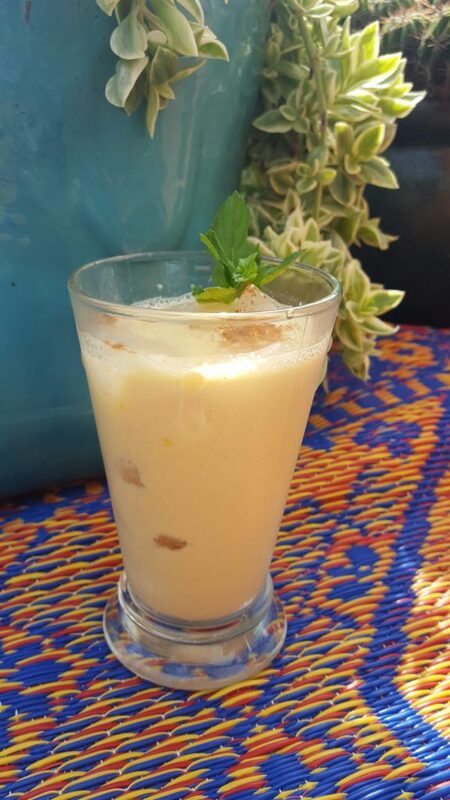 Your combination of tea and the usual lassi ingredients is really appealing! The novel (as you describe it) — not so much! Romance and food sound like a great combo 🙂 The mango lassi looks quite tasty. Thanks, Angie. It was my first lassi and I may be embarking on a romance with it! WOW – that book does have a lot of food references! Sounds like a romance with food. 🙂 Love mangos and love chai, so this lassi has piqued my interest. Sense the main character was a food writer, I think she absolutely had a romance with food!